Last week’s 13-7 victory over Indianapolis in the now infamous Snow Bowl kept the Bills alive in their playoff hunt. This week, AFC East rival Miami Dolphins come to town and of course, it’s a must win situation for the Bills. Monday night the Dolphins defeated New England 27-20 in a game that was not as close as the final score. Miami dominated throughout. That Miami win actually hurt the Bills because now the Patriots, who host the Bills next week, might not be able to rest starters in their final regular season games. The Pats sit 10-3 right now and meet the 11-2 Pittsburgh Steelers in Pittsburgh this week. The winner of that game will most likely go on to get home field advantage in the Playoffs. Should New England loose to Pittsburgh, then they are tied with Jacksonville (assuming Jacksonville wins this week) for a bye week in the Playoffs. In other words, New England won’t be able to rest some key players next week when they host the Bills. 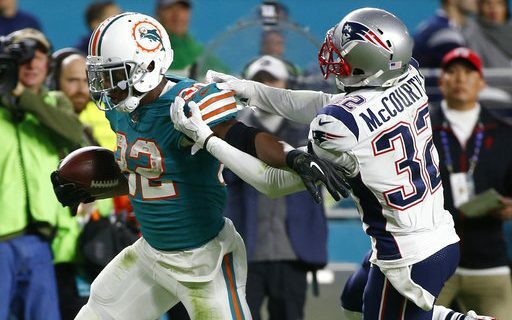 The Miami win over New England was perhaps the Dolphins best game all season. Quarterback Jay Cutler was outstanding, completing 25 of 38 throws for 263 yard and three touchdowns. Like he has been his whole career, Cutler has been inconsistent this season. But when he is on his game, he can spin sit as well as any quarterback in the NFL. Looking at the weather forecast, snow won’t be a factor as any snowfall will end Saturday. The cold weather might hamper some of the Dolphins players but not Cutler, as he spent years playing in Chicago where wind and snow are always factors in December games. The Dolphins run game has come on in recent weeks with the emergence of second year back Kenyon Drake. Drake has run for 234 yards the last two weeks as well as having eight receptions. Drake has good size and great speed and is capable of breaking a long run at any time. The Dolphins leading receiver is Jarvis Landry, who has 88 receptions to date. Landry isn’t a real big play threat as his speed is average, but he runs great routes and always finds a way to get open. Miami’s deep threats are DeVante Parker and Kenny Stills. Parker can be a matchup problem with the Bills because of his height and length. Tight end Julius Thomas can also be difficult to cover. Like the Dolphins team this season, their offensive line has been inconsistent at best. It doesn’t help that their best blocker, Ju’Wuan James, in on injured reserve. While their run blocking has been good of late, they can struggle with pass protection as they have given up 29 sacks on the year. Much like the offense, the Miami defense has been inconsistent at best but has played well recently. They have given up only 29 points the last two weeks, and helped the Dolphins win the time of possession game by not giving up first downs. Defensive tackle Ndamukong Suh can be as good as he wants and has the talent to dominate a game. He is also a fierce interior pass rusher and has 4.5 sacks to date. The Dolphins best edge rusher is ageless Cameron Wake, who at 35 has 8.0 sacks on the year. The Dolphins linebacker corps is led by former Bill Kiko Alonso, who is the Dolphins second leading tackler. He’s instinctive and tough and capable of coming up with big plays. Outside linebacker Lawrence Timmons can also be a presence on defense and is Miami’s third leading tackler. The Miami secondary has some good athletes and they play the ball well. The group has nine interceptions. Their corners, Cordrea Tankersly and Xavien Howard, are both tall and long so they will match up well against the Bills tall receivers (assuming Kelvin Benjamin plays). Like every week, for the Bills to win they have to play mistake free football. Running the ball will be important as that keeps the ball out of Cutlers hands. Friday morning’s update from the Bills declared Tyrod Taylor as the starting quartertback for this game. Taylor will have to make use of his wide receivers. This will help the run game and if the Bills can control the clock they have a strong chance of winning. On defense the key is pressuring Cutler. Cutler has a history of turning over the ball if he gets pressured and hit with any consistency.